The Town of Odyssey • View topic - The ToO Turns Seven! Post subject: The ToO Turns Seven! I am pleased to announce that the ToO has offically turned seven! 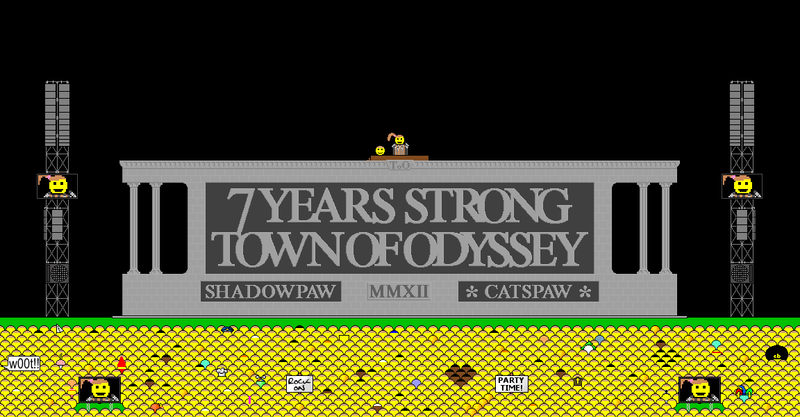 It's hard to believe that it has been so long since Shadowpaw started this amazing board! If you're interested, The Top Crusader posted a thread that will provide some background for the start of the ToO (click here). There have been a lot of great memories over the years, with new ones still being created. Thanks to Dan for providing a special anniversary surprise! Click here to see the thread that contains all the images of the construction process. Don't let the smileys down after all their hard work - go take a look! I think that the final product is especially delightful this year! Post subject: Re: The ToO Turns Seven! LOVE it! Nice work Dan! I think this is my favourite ever of Dan's anniversary surprises! I love how EB's hair has his name on the back of it! I saw the hair first and then the name, but for those of us who have ever seen a picture of him, no additional info was needed! Huzzah my first ToO birthday. My second ToO Birthday! Heres to seven years of fun! Wow, I can't believe it has been seven years!! It seemed like it was yesterday. *sniff* Good picture Dan! I would like to know who has a pink mohawk. He's basing it off of my hair of course. and Happy Birthday, ToO! I'm glad i finally joined after my sister's insistence. I'm so glad my brother found CBH's forum and met SNC who sent him to ToO, and he, in return sent me. Or something to that effect. I didn’t think I’d be back in time for this! Thank you Shadowpaw for creating such an amazing site and Catspaw for keeping it going strong! My first ToO Birthday Great job Dan! that looks amazing. I love how all those black kids segregated themselves in the center. Dan, that photo is amazing. It is the best one I've ever seen. Epic, sleek, nostalgic. Happy birthday, ToO. Congrats everyone! And wonderful picture as always Dan! Hey, I recognize that guy! His name was on Dan's monument for some crazy reason! I just looked at all of the monuments the other day and I agree with Catspaw that this one is my favorite (see I spelled it right ) one yet.